As part of the Early Years provision, music is a constant part of the children’s experience, through both singing and playing simple percussion instruments. In KS1 children receive weekly Music lessons from Kirsty Wilcockson, our specialist music teacher. In Year 3 all children receive weekly whole-class recorder lessons from Kirsty Wilcockson. For many of the children this is their first proper experience of learning a musical instrument and helps them to develop skills in notation, pitch, rhythm and performance that will be needed as they progress on to brass lessons in years 4-6. The school provides each child with a recorder which is theirs to keep, but which they are responsible for looking after throughout the year of lessons. In Years 4, 5 and 6, all children experience brass lessons. The instruments are provided by the school and in return we expect all children and parents to make an effort to look after the instruments and to take the time to practise. In Year 4 all children receive weekly large group trumpet lessons with our visiting teachers Katie Hodges and Will Russell. In Years 5 and 6 children learn either the cornet or tenor horn and learn in weekly small group lessons with our resident brass teacher, Neville Young, who is also brass teacher at Highbury Grove School. Our weekly singing assemblies are an opportunity for children to learn new songs and to develop their skills in singing. Key Stage 1 has their on Wednesday with Kirsty Wilcockson whilst Key Stage 2 has theirs on Tuesday with Music Subject Leader, Rachel Besbrode. We have two choirs, KS1 and KS2. The KS1 Choir, led by Kirsty Wilcockson works throughout the year on a range of songs whilst developing skills in singing that they will carry forward into KS2 and hopefully the KS2 Choir. The KS1 Choir performs annually at the Canonbury Summer Concert. The KS2 Choir performs a range of songs that challenges the children to sing in multiple harmony as well as offering solo opportunities. The Choir performs at both the Canonbury Christmas and Summer concerts as well as the Highbury Grove Christmas Concert and the Islington Pure Voices event each summer. Both choirs are open to anyone who wishes to join from the appropriate key stage. The orchestra, led by Ginny Strawson, is open to children in Years 4-6 who have been learning an instrument for at least a year and who pass an informal audition. The orchestra performs a range of repertoire including works that they compose and develop themselves in their weekly Wednesday rehearsals. We currently offer piano and violin lessons which can be individual or shared. There is a waiting list for these lessons but if you are interested please speak to Sarah Ouldcott in the school office. We have two whole-school concerts at the Union Chapel, one at Christmas and the other towards the end of the summer term. We also host regular in-school concerts to show the children’s progress in their instrumental learning, as well as spring term recitals for our violin and piano pupils who learn with our visiting peripatetic teachers. For EYFS we hold an annual summer performance, in school, in which Nursery and Reception can showcase their musical learning from throughout the year. Each year KS1 and 2 go to a key-stage focussed schools concerts performed by the London Symphony Orchestra at the Barbican, a fabulous opportunity to hear one of the world’s greatest orchestra perform live. The KS1 concert is usually based around a story book and the children learn songs that have been written specially for the concert. The KS2 concert is usually based on a well-known piece of classical music. Prior to the concert the children have the opportunity to create their own compositions based on the work. 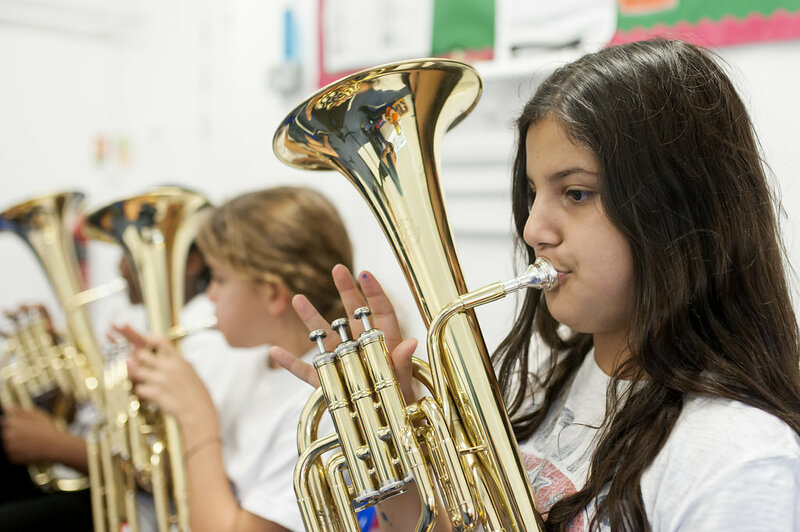 KS2 pupils are offered the opportunity to join The Islington Music Education Hub, a weekly after school session at Highbury Grove School in which children have further opportunities to perform on their instrument and develop ensemble skills. They take part in a fantastic annual performance at the Hackney Empire.